If the Holmes-Rahe Stress Inventory applied to organizations, even standard merger and acquisition transactions would be near the top of the scale. And the more complex the deal, or the greater the antitrust concerns, the higher the pressure. Top that with a “Request for Additional Information and Documentary Materials,” also called a “Second Request,” from the Federal Trade Commission (FTC) or the Antitrust Division of the Department of Justice (DOJ), and the stakes can start to feel incredibly high. A Second Request comes into play for transactions that meet a minimum threshold— currently $84.4 million—under the Hart-Scott-Rodino Antitrust Improvements Act. No matter the industry, all Second Requests share two variables that seem, at first blush, to be diametrically opposed: a potential scope of review that includes an unlimited number of documents and an exceptionally limited amount of time to produce them—sometimes as short as 30 days. The requested material can span the breadth of an organization, from financial information, business plans, pricing and competitive strategies, industry participation and research and development details all the way to manufacturing and production documentation. A failure to “substantially comply” with the request can prompt a variety of further government action that can be devastating to the success of the deal. 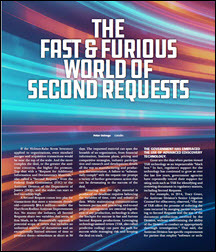 between parties and practicing end-to-end project management are essential ingredients of any production, technology is often the linchpin for success in fast and furious Second Request productions. Leveraging technology-assisted review (TAR, also called predictive coding) can pave the path for success while managing risk and keeping the deal on track. This article was originally published in USLAW Magazine Spring 2019 issue.